This waterfront villa is in a prestigious location on the St. Lucie River. 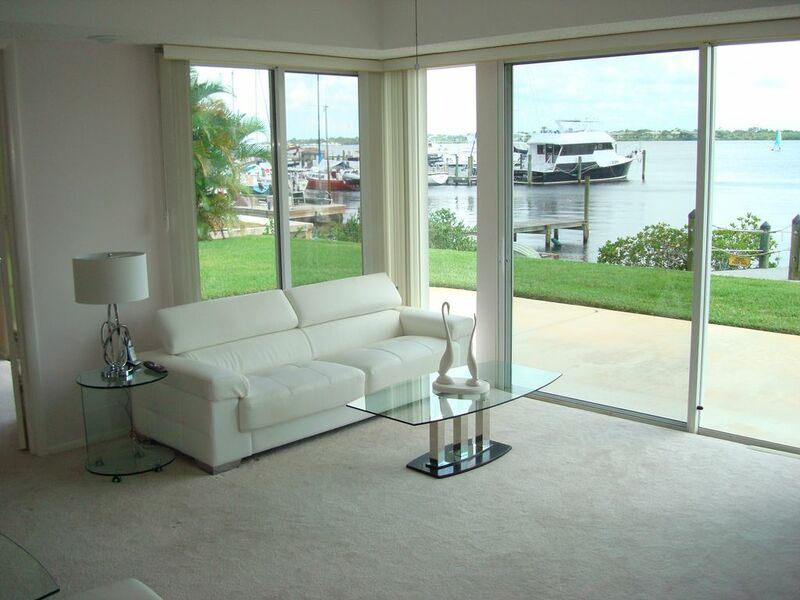 One of six Sandpiper Bay models with a breathtaking view of the wide St. Lucie River. Completely secluded, this villa has been totally remodeled and has a view of the river from every room. With its own private dock and concrete patio, overlooking the almost mile-wide St. Lucie River, you have breathtaking views of gorgeous sunsets, dolphins jumping out of the water, and all kinds of tropical birds. Take advantage of the excellent fishing, right off your own private dock. Surrounded by three golf courses, the lovely all-inclusive "Club Med Resort", the "Ballantrae Golf and Yacht Club" and the "Saints" Golf Course Lounge and Restaurant. At Club Med Resort, you can purchase various day membership packages to golf, dine at one of their fantastic restaurants and lounges, or buy various resort privileges. Golf daily or buy one of their varied golf course memberships. As a Villa of Sandpiper Bay, you can enjoy the large heated pool and Jacuzzi with a covered area to get out of the sun if you desire. We are 15 minutes to the beaches, 5 minutes to the mall and quaint shops, outdoor restaurants and cafes of downtown Stuart and Jensen Beach. Everything is close by to the Villas of Sandpiper Bay. Feel like taking a day trip around Florida? We are located approximately 1 3/4 hours to Miami, Walt Disney World and Daytona Speedway. The perfect location for those day trips up and down the beautiful East Coast of Florida and some of the best beaches in the state. Private dock, 2 boat lifts available (for additional fee). Our family was not disappointed with any of the information provided to us by this property owner. We loved the location. If you're a golfer you have several choices within 5 minutes of your front door. The view of the Indian River is breath taking! We were provided with recommendations for dining and were very pleased with the choices. We would recommend this villa to family and friends! Looking forward to returning ourselves! This is an excellent rental location on the river. Owners are accommodating.